Pink true love badge in a lovely light pink colour with True Love written inside a cute love heart and white polka dot pattern around the edge. These love badges are perfect for Valentines Day and your loved one will be super happy to receive one. We have a vast range of valentines day badges and love badges available, as well as anti-valentines day badges. Standard 25mm (1 inch) badge made in our badge workshop. 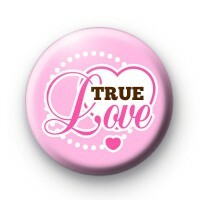 We have a range of love & romantic badges as well as wedding badges so be sure to browse our other categories. Free delivery available on larger orders.